I have been struggling to find things to bake lately....I have already posted most of the recipes I use regularly, and I just don't have enough mouths in my house to consume a new baked good every second day. So, last night I decided to try something different...cooking (well, half cooking...). I made a vegetarian, dairy-free frittata for my parents' dinner. Dad ate half of it...with ketchup, and mom took more to work with her for lunch. 3. Add onion and garlic, and cook until onion is translucent and brown. Deglaze the pan with some cold water, to get all the browned (but not burnt) bits from the bottom of the pan. 4. Let the water evaporate, then add the other vegetables and seasoning. 5. Cook until tender and spinach is reduced. 6. Whisk eggs and 3 Tbs water in large bowl (plus extra seasoning, if you'd like), then mix the vegetables into the egg bowl. 7. While the pan is clear, add a little more oil to make sure the eggs don't stick, then pour your eggy mixture back in. 8. Cook on the stove for about 5 minutes, to set the egg and cook the bottom. 9. Transfer to oven to cook the rest. Mine took about 25 minutes or so, but it'll depend on the thickness of your mixture. Just keep an eye on it, and remove from oven once edges are golden and the center is set. Mmm yes… I also predict this would be extra delicious with cheese. 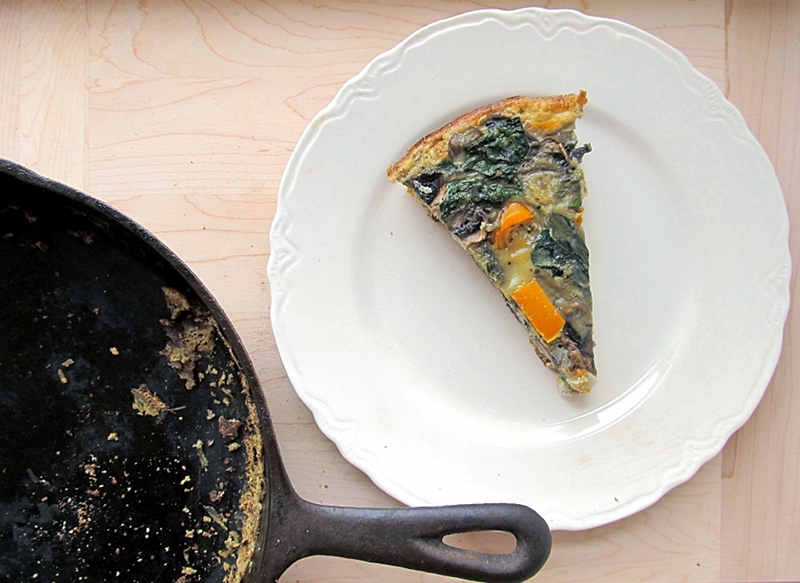 What is the difference between a frittata and a quiche? Is it just a crust for the quiche?